What a Manta Season at Hurawalhi Maldives! What a couple of months we’ve had at Hurawalhi Maldives! We usually start seeing manta rays in November around the Fushivaru area, which can be reached in some 10 minutes by speedboat, before they make their way to the second manta ray hotspot, the long sandbank area between Hurawalhi and the neighbouring Kuredu Island Resort & Spa. January certainly delivered and we had a great month together with plenty of manta rays directly in front of our door. From the end of December, the area around the Dream Island, the small sandbank right next to Hurawalhi, was the site where manta rays decided to roam around almost daily, feeding directly underneath the water surface. Probably those mantas were coming here for already many, many years, thus being very confident and familiar with the area around Hurawalhi; they even found their way into the island’s lagoon, directly in front of our Ocean Watersport Center. Guests were regularly dropping by at the center to tell about their incredible manta ray sightings when snorkelling just right outside their Ocean Villas. Manta rays, the gentle and peaceful ocean travellers, enchant us with their beauty and grace every time we meet them. 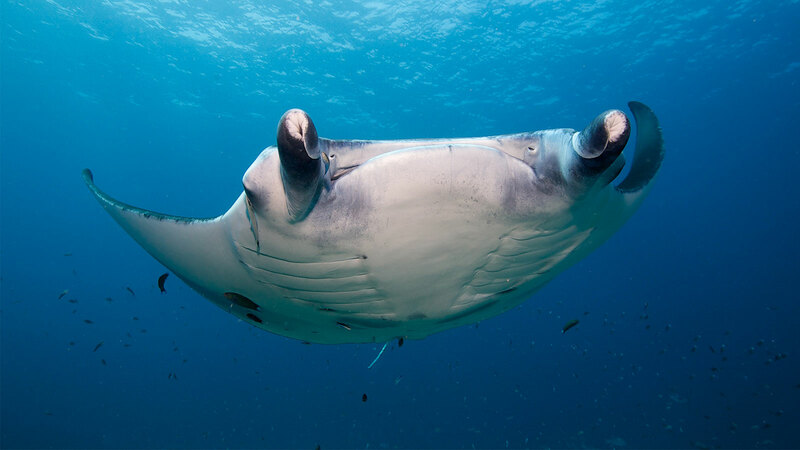 Unlike the majority of other marine life, mantas are inquisitive and seem to really enjoy our company. As long as we treat them with respect and allow them to freely go about their business, they don’t shy away and oftentimes you will see them within an arm’s reach! This definitely makes your heart beat faster for some seconds and you will never forget this encounter! Make sure you don’t miss your chance to meet the manta rays! We keep following them on their journey across the Lhaviyani Atoll, so if you’re coming to Hurawalhi, be sure to sign up for the Manta Ray Search Excursion.